Ten Percent Discount for Ten Days, across our entire range of products online. 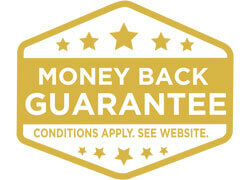 Plus, buy any two products or packs from our range and receive a FREE Gentle Cream Cleanser 125ml valued at RRP $19.95. For a limited time only while stocks last. Offer expires midnight WST Saturday 27th August, 2016. Not available in conjunction with any other offer. To take advantage of this offer enter the coupon code 10FOR10 at the final stage of the checkout to receive 10% OFF your order or telephone our office on 1800 729 729 and we can assist in processing your order. 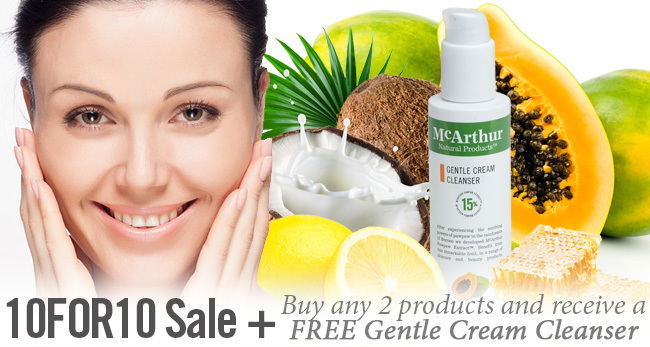 McArthur Natural Products’ Complete Skincare Cream varieties are now on sale at 20% OFF. Offer expires midnight Wednesday 10th August, 2016. To take advantage of this offer enter the coupon code COMPLETE20 at the final stage of the checkout to receive 20% OFF your order or telephone our office on 1800 729 729 and we can assist in processing your order. Win one year’s supply of your selected product from the McArthur Natural Product’s range – limited to 12 selected single (not pack) items, one product per month. 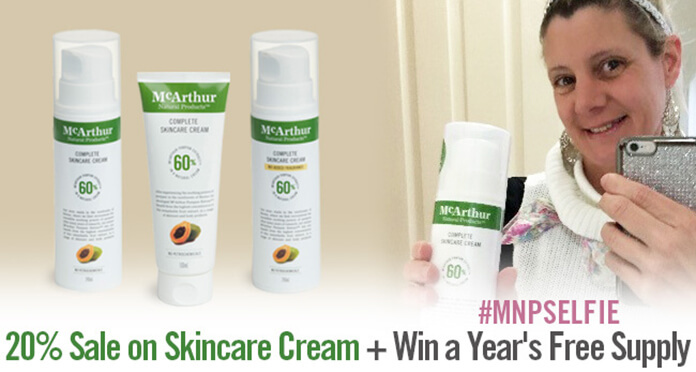 To enter the competition take a photo of yourself with any one or more products from McArthur Natural Products displayed clearly within the photo and use the hashtag #MNPSELFIE. Post the photo onto either Facebook, Instagram or Twitter, and tag the McArthur Natural Products’ account on that channel in your post. This competition commences Tuesday 2nd August and is drawn Wednesday 31st August 4:00pm WST. The winner will be selected by McArthur Natural Products from the photos submitted and announced on our Facebook page on Thursday 1st September, 2016.